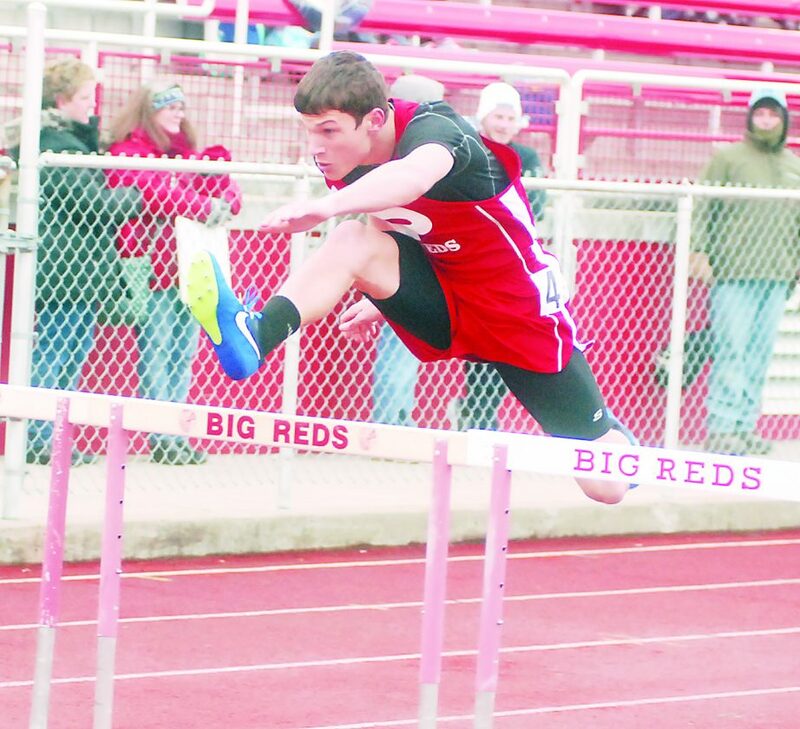 Photo by Jay W. Bennett Parkersburg High School's Aaron Kupfner posted a victorious time of 15.94 in the 110 hurdles during Friday night's Kim Nutter Invitational at Stadium Field. PARKERSBURG — On a chilly Friday evening at Stadium Field, the Wheeling Park track program made it a clean sweep by topping the field at the Kim Nutter Invitational. Parkersburg’s boys were seeking a three-peat, but the Patriots bested the hosts 168 to 143 with Parkersburg South’s 97 points taking third. The Wheeling Park girls successfully defended their crown by topping runner-up Parkersburg South, 145-110. PHS was third with 84. Despite not having enough to win the team titles, the Big Reds had plenty of individual success as too did the rival Patriots of Parkersburg South. Big Red Aaron Kupfner and South’s Erin Williams were both double-winners. Kupfner won the 110 hurdles with a time of 15.94 and the 300 hurdles with a 43.74 clocking. The Big Red edged South’s Haden McConnell (16.40) in the 110 hurdles and Tyler Consolidated’s Zack Placer (44.58) in the 300 hurdles. Williams’ effort of 5 feet in the high jump took gold and her 15-10.75 in the long jump was good enough to trump Parkersburg Catholic’s Aaliyah Brunny (14-9.75). Brunny finished third in both hurdles events. The PHS boys of head man Rod O’Donnell also got first-place efforts from Justin Waybright in the discus (128-9), Ethan Rutherford in the 400 (54.24), Benjamin Lake in the 800 (2:05.35) and Anthony Bradford in the mile (4:41.05). Lake just held off Bradford in the 1600 and his time of 2:05.64. Rutherford edged Tyler Consolidated’s Destry Nelson (55.76). Bradford, Kupfner and Lake shared high-point honors with 20 apiece. Like the red and white boys, the PHS girls of head coach Lia Fleek also weren’t at full strength. However, Madison Trippett won the 800 with a 2:20.76 showing. Parkersburg’s girls also captured the shuttles with a winning effort of 1:13.79 thanks to Emily Kupfner, Delaney Cox, Sara Brace and Holly Chapman. PSHS boys head coach Erwin DeGraef had first-place showings from Brandon Penn in the long jump (18-8.25) and Levi Rice in the 200 (24.29). Penn topped teammate Tyler Blevins (17-8). Williams also ran a leg on South’s 4×400 team that finished first in 4:30.34 along with teammates Marimo Akita, Kaley Buffington and Samara Nunn. The only other area boy to win a title was Tyler Consolidated’s Spencer Corley in the high jump (5-10). John Marshall’s Zara Zervos won high-point honors with 29.5 thanks in part to wins in the 400 (1:01.86) and the 1600 (5:32.81) along with finishing runner-up to Trippett in the 800. Zervos topped South’s Abby Herring (5:37.99) in the mile and nipped Nunn’s time of 1:02.78 in the 400. Wheeling Park’s girls had repeat individual titles from Abby Snedeker in the 100 (12.88) and 200 (27.66). She finished ahead of Akita (13.08) in the 100 and runner-up Big Red Sofia Strobl (28.84) in the 200. Park’s Aubrey Wiethe swept the hurdles hurdles events with clockings of 17.75 in the 100 and 49.06 in the 300 and also defended her titles from 2018. The Park Patriots also had repeat individual titles by pole vaulter Brady Browning (8-0) and Cheyenne Nash in the shot put (35-7). The boys from Wheeling Park almost swept every relay event, but Parkersburg South won the shuttles in 1:04.48 with Kyle Carpenter, Corey Beverage, Haden McConnell and Mason Cheuvront. Also winning individual events for the boys were Wheeling Park’s Justin Levelle (100, 11.30), Christian Sorge (pole vault, 12-0) and Jermain Snodgrass, who defended his shot put crown after besting Big Red Shane Miller, 47-5 to 42-8. Sorge topped Big Red runner-up Buddy Roberts, who cleared 10 feet, 6 inches. Champion WPHS also won the 3200 thanks to Ronnie Saunders, who defeated Big Red Franklin Angelos, 9:59.22 to 10:10.06. For the girls, other top of the podium finishes came from Robert C. Byrd’s Lura Simons in the discus (96-1) and Park’s Emma Delk clocked in at 12:20.74 to win the 2-mile ahead of South’s Shannon Ruble (13:01.18).